This line orginated from Essex, England. Thomas was born Abt. 1130 in Essex, England. It is said that he was Knight of Coggeshall. There are a number of manuscript genealogies of early Coggeshalls in the British Museum (the manuscript collections are now under the jurisdiction of the British Library, a separate institution). I am searching for a copy of any of these. Thomas was born Abt. 1180 in Essex, England. He was Knight of Coggeshall. Ralph was born Abt. 1227 in Essex, England and died in 1305. He was Knight of Coggeshall. He married Elizabeth. John was born in Essex, England and died in 1302. John was born 1277 in Essex, England and died in 1319. He married Sara le Brun. She was born 1282. John was born 1302 in Essex, England and died in 1361. He married Margaret De Stanton. She was born 1311. It is documented that he was knighted by Edward the Black Prince. Lord of Coggeshall (which he deld of the Abbots of Westminster and of Coggeshall), who was born c. 1302, and was knighted by Edward he Black Prince in 1337. "He was a considerable man in his time," being High Sheriff of Essex and Hertfordshire 1336-49 and 1353-56. he married Margaret, daughter and heiress of Humphrey de Stanton, from whom she received the manor of Alesford. Under a writ of diem clausit extremum the Inquest Post Mortem (similar to our probate inventory), 26 June 35 Edward II, 1361, showed that Sir John held the manors of Sutton, Beneflete, Coldham, Coggeshall, Samhill, Hokewell, Ailsford, Fratyng and Thoriton, Pagesham, and Roghir, in addition to lands in the towns of Bokkyngg (Bocking) and Feryngg (Feering), co. Essex, all of which went to his eldest son Sir Henry de Coggeshall. Henry was born Abt. 1331 in Essex, England and died in 1375. He is buried in Coggeshall. He married Joane de Welles. She was born 1335 and is said to have received the manor of Great Samford. William was born 1358 in Essex, England and died in 1424. He married Antiocho Hawkwood. She was born Abt. 1365. Sir William de Coggeshall, of Codham Hall, Wethersfield, Knight, who was born c. 1357, and was High Sheriff of Essex and Hertfordshire 1391. He married Antiochia, daughter and heiress of Sir John Hawkwood, the celebrated Captain of Condottieri, the White Company, in Italy and France (whose career is covered in some detail by Barbara Tuchman in her best seller, A Distant Mirror, pp. 225, 254-8, 322-3). Sir William, by his wife Antiochia, "had issue no sons but four daughters," among whom his estates were divided after his death in 2 Henry VI, 1424. Sir William, by his wife Antiochia, "had issue no sons but four daughters," among whom his estates were divided after his death in 2 Henry VI, 1424. Thus ended the senior line of the Coggeshalls of Coggeshall. Alice was born Abt. 1388 in England and died in 1422 in England. She is buried in East Horndon, Essex, England. She married Sir John Herron Tyrrell ca. 1407. He was born 1390 in Heron, England and died 1437 in England. Granddaughter of the famous English soldier, Sir John Hawkwood, Knight of Essex, who for many years during the wars in Italy was commanding General of the Armies of Florence. 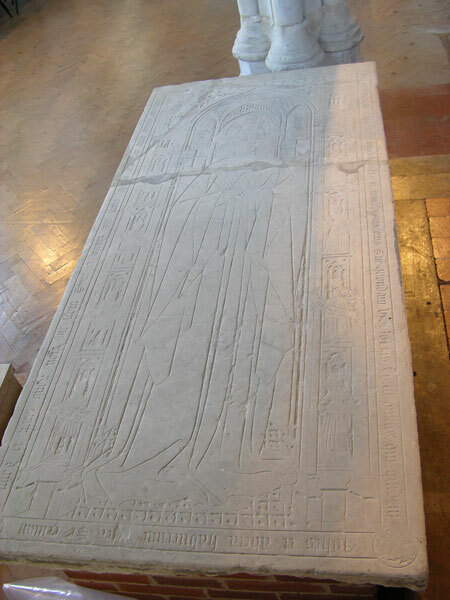 In a Chapel at East Horndon there remains to this day a beautiful alabaster slab tablet to the memory of Lady Alice Tyrrell, upon which were outlined her figure and face, placed in the church 1422. Dicken says that she was a co-heiress to her father's fortunes. ** Note: I actually descend from both of these brothers!! This will will continue on the Tyrrell Family page. They have direct connections to William the Conqueoror!! **My DE COGGESHALL line ends here with Alice De Coggeshall and becomes Tyrrell. **Note: The information gathered here is a piece by piece collection from many sources that I have combined personally to create a more complete early De Coggeshall Family History. If you would like to know the sources used to gain this information or have information to contribute or correct, please feel free to email me.